​Wright, N. (2012) 'The Partnership Business', Training Journal, Fenman, June, pp58-63. You arrive at the meeting and, before you’ve had chance to speak, your client presents you with a list of items they would like you to address. They smile confidently and satisfied, convinced they’ve provided you with what you wanted and they needed. You feel off balance and frustrated. This isn’t how you had imagined the meeting panning out, it’s not what you had hoped for as a business partner and you feel lost for words. If you’ve ever had this experience, you’re in good company. It’s a common experience of L&D and HR practitioners. The question is how to shift from service provider to a wider business partner role. What are the factors that influence a successful shift? How can you move into a more effective business partnering model that both feels more holistic and effective and that the client values too? These are the questions I will seek to address in this article. What’s your contribution to what you are experiencing? It’s easy to attribute sole blame to the client. ‘He doesn’t understand what my role is’, ‘She doesn’t want a partner, she wants a servant to do her work for her.’ Although understandable, these reactions nevertheless may say as much about the business partner’s approach as that of the client. If you feel trapped in service provider or some other mode, consider very carefully what you may be doing to reinforce this view in the mind of the client. Business partners often talk about aspiring to fulfil more of a strategic role. Think about this carefully before every interaction with a client. What’s the picture you hold in mind of yourself as business partner, the role you aspire to fulfil? How would you conduct yourself in that role? How proactive would you be in the conversation? How would you be framing or reframing conversations? What would you be talking about and, equally as importantly, not talking about? This is about creating a compelling vision in your own mind of what operating as a business partner would look and feel like then acting out that role when you enter the room with the client. It’s about shaping as well as responding to the client’s thinking and agenda. In doing so, it’s about consciously and subconsciously shaping in the client’s mind what your role is, how you see your roles together and what you can bring that could add value. Such a shift requires skill and, therefore, practice. Don’t be disappointed if the client looks surprised the first time you enter or reframe a conversation in this way. They are likely to already hold expectations in mind about you, your role, who should do what and so reshaping expectations will take time and perseverance. In most cases, it involves working with the client’s agenda initially but gradually introducing fresh perspectives and ideas as conversations progress. Over time, if the client finds your perspectives and approach valuable, they will think of you less in terms of formal role and more in terms of the value you can bring to the opportunities and challenges they face in their own role or sphere of responsibility. In NLP, the influencing approach you are using is called ‘pacing and leading’, meeting the client where they are, in the issues they find pressing and important and gradually creating a perceptual and experiential shift. I worked with one new client who was about to launch important organisational changes. She wanted and expected me to design the new structure, write the new job descriptions and create the change plan on her behalf. I could see she was relatively inexperienced and struggling in this area and it was tempting to step in to, in effect, manage the change for her. Previous business partners had fulfilled this role for her and so that set the scene for our first conversation. It was a tricky situation. How to build rapport and credibility with the client whilst, at the same time, believing there would be greater and longer-term benefit in enabling her to step back from the immediate pressures to consider and address wider issues; e.g. what the rationale and options for change were, how to learn how to lead the change effectively herself. I could see and hear the client was feeling stressed so I needed to handle this sensitively. At first, she responded with frustration and resistance. She complained that previous business partners had been more helpful. She insisted it was my job to do what she was asking. I had to hold my nerve, to convince her I was on-side and, at the same time, to hold onto my own professional judgement. I had to carefully frame and reframe this and subsequent conversations around goals, roles and respective contributions to achieving the outcomes we both desired. Over time, the client became more open. We contracted in a more equal partnering way. We discussed and negotiated our roles as things progressed in light of our respective responsibilities, immediate demands and longer term capacity building goals and aspirations. I acted as coach and consultant alongside her and the team as she led the changes. She learned how to lead and, at the end, she reported that this was a far more valuable partner relationship than she had experienced previously. I can almost hear some readers objecting at this point. ‘I don’t have that freedom to negotiate roles. My role is fixed and determined by the organisation.’ It’s true. In some organisational cultures, it is harder to flex role boundaries than in others. At the same time, business partnership is fundamentally about navigating relationships with people. In my experience, where on-going working with people is concerned, there is always some scope for influencing and negotiation. What’s your model of business partnership? Apart from any formal job description, the partnership model you hold in mind will influence what you perceive as your role, what options are available to you, your negotiating position and your intervention strategy. I’ve found it helpful to articulate my own model in diagrammatic form (see figure 1). This conceptual framework enables me to articulate and navigate conversations with clients according to what would add optimal value in each situation. The model assumes that, within any specific organisational strategy, cultural framework and client relationship, the business partner may shift mode in relation to the client depending on what is needed. Unless explained clearly to the client, however, this can prove confusing or frustrating. ‘I was expecting you to organise a training course for my team but now you seem to be trying to coach me.’ The important thing is to clarify, discuss, negotiate and contract where needed. I position the model within a wider strategy and culture framework in order to provide a sense of purpose and keep the wider organisational agenda in view. I place quality and accountability within the model as that’s what the business partnership should aim to achieve. 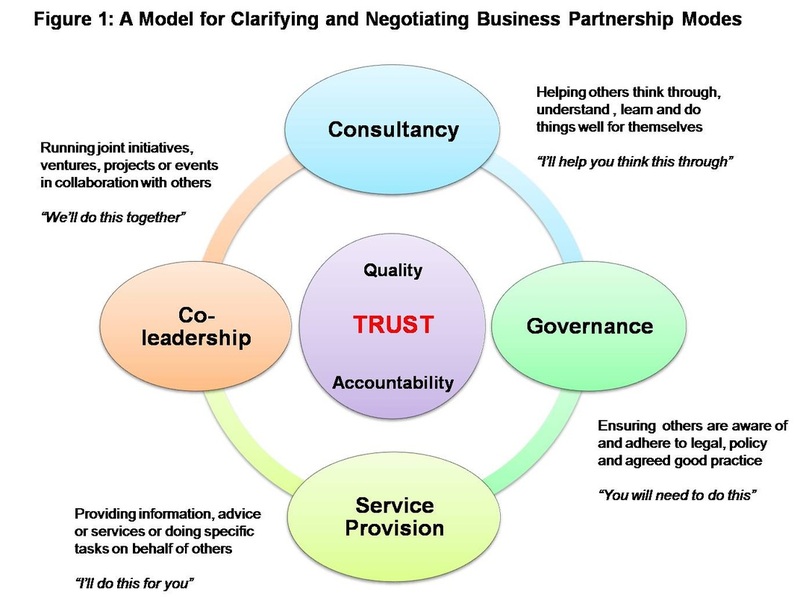 When training on this model, I place trust at the centre as, in my experience, it’s fundamentally the quality of relationship that determines whether any business partnership will be successful. So, imagine a conversation along these lines. The client invites you to work with him on a talent management strategy. You have a number of intervention options open to you at this stage. The choice of intervention is likely to be determined by a number of different factors; e.g. formal role requirements; the client’s expectations; the client’s level of previous experience in this area; the urgency of the task; your professional judgement on what the situation calls for. You have a number of options on the table. You could, for instance, start by clarifying your respective roles and responsibilities. ‘This is my job...and that is your job.’ It draws clear lines in the sand but can feel formal and bureaucratic. You could, on the other hand, inquire, ‘What does this situation call for?’ and discuss your respective contributions from that place. ‘Let’s look at what we could each do to move this forward’ feels more collaborative and solutions-focused. In ‘consultant’ mode, you could coach the client on how to approach the strategy well in order to achieve a good result. In ‘co-leadership’ mode, you could lead it together with shared responsibility for the outcome. In ‘service provider mode’ you could develop and deliver it on the client’s behalf. In ‘governance’ mode you could help ensure it meets good practice standards. There is no definitive right or wrong to these choices. It’s more about exploring benefits and implications. If you mostly operate in consultant or coaching mode, it will build the client’s capacity and confidence to address opportunities and challenges in the future. The client retains responsibility for leading and the business partner assumes responsibility for helping the client think through and address relevant issues, options and implications. The risk is that coaching the client may take longer than project deadlines or other time constraints allow. If you mostly operate in co-leadership mode, the client is likely to feel supported by sharing the joys and burdens of leadership with you. Success or failure of the project is the joint responsibility of client and business partner. This gives both a vested interest in working together well to achieve shared goals. The risk is that business partners may find themselves carrying responsibility for frustrating, suboptimal outcomes if the client fails to deliver on their part. If you mostly operate in service provider mode, clients may value your hard work and services, especially if you are providing things that lie beyond their expertise, time availability or resources. It can also build a platform of credibility and trust if your services are of a high quality and reliable. The risk is that you may build an unhealthily dependent relationship or that the client may treat you as a servant rather than an equal partner with your own goals and responsibilities to fulfil. If you mostly operate in governance mode, clients will be well informed about, enabled to comply and held accountable to legal requirements, organisational policies and good practice standards. It can help to ensure consistency of practice across the organisation and to avoid unnecessary risks. On the other hand, the converse risk is that clients may view the business partners as interfering, overly-bureaucratic or policing and, thereby, avoid or ignore them. Who fulfils which role in practice? What role the business partner takes, what he or she can bring to the table to add value, depends on what business partnership model the organisation or client expects, what experience the client already has and what model the business partner holds and aspires to. Overall, business partners need to be able to establish rapport, credibility and trust with clients. They need to be skilful at operating in each mode as well as to navigate between them flexibly and seamlessly. I’ve noticed that some business partners approach clients in pure task-orientated mode. It can make the relationship feel cold and transactional. I prefer to approach clients as human beings rather than as objects or roles to negotiate with. This creates the foundations for trust building that will be critical as you continue to work together. The biblical principle I try to bear in mind is ‘grace and truth’, a warm human, valuing intention combined with genuine honesty and integrity. I sometimes use something like the following briefing to explain and discuss how I see my role vis a vis the client and the task and to surface any underlying assumptions. Bear in mind that the different modes represent different emphases or focus points in a business partner relationship or conversation rather than tightly differentiated roles or rules of engagement. Separating into distinct modes is a simply a conceptual map that aims to help bring clarity and open fresh possibilities. “You [client] are responsible for good people leadership, management and development in your part of the organisation. Partnership means bringing my knowledge and expertise to bear alongside yours to help you make wise decisions and to succeed. I will help you identify key issues that you would do well to bear in mind and, as appropriate, offer you challenge, guidance and advice. Unless there are legal, ethical or policy issues that are compelling or prohibitive, the final decision will be yours. “You [client] and I hold shared responsibility for good people leadership, management and development in your part of the organisation. Partnership means pooling our knowledge and expertise to achieve a better outcome than either of us could achieve on our own. We will each bring our own contribution to the table: e.g. personal style, vision and values; roles and responsibilities; group/team goals; knowledge of key issues; professional experience and expertise; proposals for the way forward. “You [client] are responsible for good leadership and management in your part of the organisation. Partnership means providing you with practical support by doing tasks that you don’t have the time or technical expertise to do. My [L&D-HR] role is to supplement your work and thereby release you to focus on other tasks. The focus of our relationship is on achieving people and culture-related tasks that you identify as priority in a timely and efficient manner. “You [client] are responsible for good people leadership, management and development in your part of the organisation. Partnership means that I will contribute my professional knowledge and expertise to help you fulfil relevant legal, policy, procedural or good practice standards. This will help ensure that your plans and decisions will lead to high quality results and satisfy organisational requirements and relevant codes of practice. *Take an active interest in clients as people. Don’t relate purely at a task or transactional level. *View every action is an intervention. Treat every interaction as an opportunity for influence, aimed at building capacity and credibility. *Plan the presence you want to model. Imagine how you would relate as a strategic business partner, then act it out in practice. *ABC (Always Be Contracting). Agree desired outcomes and ways of working with the client, including which party will do which part, and periodically review. *Demonstrate trustworthiness. Always maintain confidentiality and deliver on agreed actions. *CPD (Continuous Professional Development). Invest in your own on-going development to bring optimum value to the client and organisation.